Manila, Philippines – The Professional Regulation Commission (PRC) released the Sanitary Engineering Board Exam results for January 2019 two (2) working days after the last day of exams. The Sanitary Engineering board exam results also include the top 10 examinees and the top performing Sanitary Engineering schools. PRC announced that 45 out of 92 examinees passed the exams. The Board of Sanitary Engineering conducted the licensure exams on January 15-17, 2019 at PRC testing centers in Manila. Moreover, the board of Sanitary Engineering, headed by its Chairman, Engr. Corazon De los Reyes-Romero and its members, Engr. Alfredo B. Espino and Engr. Florimond M. Lara administered the exams. Sanitary Engineering is one of the programs with less number of examinees administered by PRC. For passers of Sanitary Engineering board exam January 2019, the schedule of online appointment for issuance of Professional ID and Certificate of Registration will be from February 11 to February 13, 201. Here are some of the important reminders. Firstly, PRC is strictly implementing the online registration system for all passers effective March 30, 2016. Secondly, PRC said that successful Sanitary examinees shall personally register and sign in the Roster of Registered Professionals. Thirdly, initial registrants shall register at its online portal via this link. See Also: How to pass PRC board exams? PRC normally releases the Sanitary Engineering board exam in 2-4 working days after last day of exams. Likewise, in the publicly released PRC Resolution No 1127 Series of 2018 or the “Schedule of Licensure Examination for Year 2019”, the target release of Sanitary Engineering board exam result January 2019 was in two (2) working days after the exams or by Monday, January 21, 2019. In the most recent Sanitary Engineering board exams conducted on August 2018 as well as the three (3) consecutive exams, results were out in two (2) working days. PRC also reminded that the filing of application including the submission of all supporting documents at the Central and Regional Offices shall have to be within the period of indicated schedule. The next schedule of Sanitary Engineering Board Exam for the Year 2019 will be on August 6, 7 & 8, 2019. PRC added that the deadline of filing of application is final and shall be strictly implemented, that no extension will be entertained or considered except when deadlines fall on legal or regular holidays and non-working days, the deadline shall be automatically moved on the succeeding working day. No changes in the schedule shall be made without prior approval by the Commission. The sole purpose of the website is to provide readers and users with quick, up-to-date as well as reliable information about board examination results. 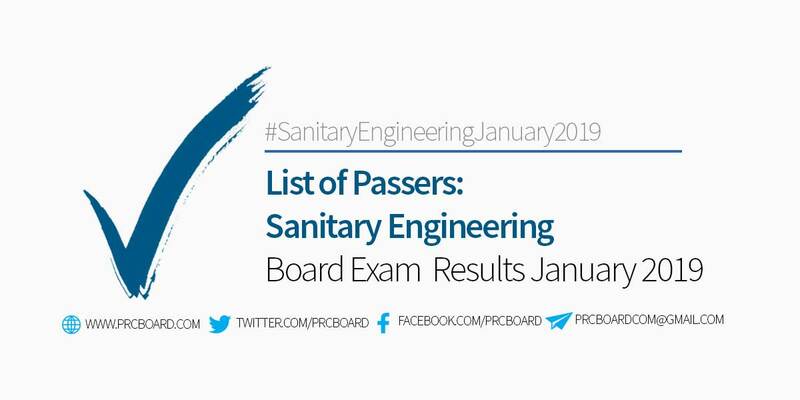 For updates on January 2019 Sanitary Engineering board exam results, we advise our visitors to bookmark this page, visit PRC official website, follow us at our social media pages via Facebook and Twitter or join the members discussions at our Facebook Group.